The Large Family Heirloom Seed Collection is the perfect package for the large family, market grower, or a community garden. A large selection of our best all-around vegetable and fruit garden seed varieties, all open-pollinated, non-hybrid, and Non-GMO. We have selected varieties that should generally do well in all areas of the U.S., as well as varying soil and light conditions. Packed with a great balance of fresh and canning fruits and vegetables to supply your family with high nutritional value for a year, the Large Family Heirloom Seed Collection will fill a large garden plot with delicious home grown goodness. The Large Family Heirloom Seed Collection is a great choice to save you money, saving at least 10% off the original cost of all the seeds in the package! Not only do you save money, but also the guess work of trying to figure out what garden seed varieties to pick, they’re all right there, a well rounded selection of family favorites. Yes, and one more way our seeds can save you money, they are all open-pollinated (commonly called heirloom), able to be saved and replanted next year, always coming up as the same variety (provided plants are not allowed to cross pollinate). When you save seeds from the Large Family Heirloom Seed Collection and use them next year you save all the more in your family budget. This convenient vegetable garden seed package is an excellent choice to save you time and effort, both of so much value to a busy family. Happy Gardening! 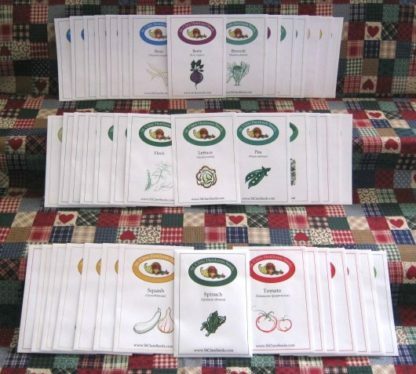 Note: We reserve the right to substitute a similar vegetable garden seed variety if any listed in the Large Family Heirloom Seed Collection is out of stock. Thank you for your understanding! First-Ever Potager Garden and everything produced even though I had no idea what I was doing most of the time! I sowed everything straight into the soil and we had a terrific yield (even though the raccoons took our corn). Great variety! Great taste! Thank you!